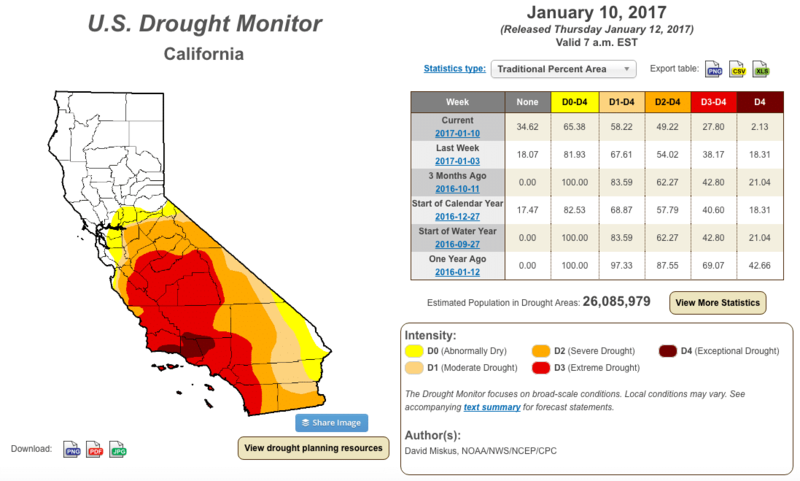 This is the worst drought the state has seen in 1,200 years, and it could come back. After five years, 3.7 meters (12 feet) of snow and half a meter (20 inches) of rain finally signal the end of the great California drought. For half a decade, California suffered through what experts say was the worst drought the state has seen in 1,200 years. But winter saw the arrival of storms that brought much needed rain and snow, improving California’s water supply. In terms of surface water, most of California is no longer in drought. The accumulated reservoir and soil moisture deficits of the last 5 years have been filled in most of the state. Only Santa Barbara, supplied by Lake Cachuma (currently 11% of average storage), faces major urban drought. According to the US Drought Monitor, around 42 percent of the state is now drought-free. A year ago, 97 percent of the state was in drought. So it certainly seems like things are looking up – if the storm systems keep coming. Right now, California’s reservoirs, rivers and lakes are topped up, thanks to constant rains. But weather can be very unpredictable, and experts need more time to see if this weather pattern will sustain itself throughout the year – long enough to definitively bring the state out of this dry spell. Even if the current weather is in fact indicative of the end of the drought, the state is still reeling from the impact of the five-year long dry spell. Californians also rely on groundwater, the stuff that accumulates naturally beneath the soil in deposits known as aquifers. Across the planet, most of our land areas have some form of aquifer beneath them. Some are super deep; others are rather shallow. But many of them are being depleted as cities and towns increasingly draw water from them for irrigation and industrial purposes. California aquifers have yet to recover from the five year drought, if they will be able to at all. For instance, Central Valley, a region known for its thriving agriculture, may never return to its pre-drought conditions. The logic behind his approach is simple, if policy-makers continue to consider California’s dry state as a drought crisis, then the term’s relevance and urgency is diminished, which then leads to less motivation for the public to conserve in extreme conditions. In any case, after what California has been through, water conservation is basically a way of life for residents of the state. And given the threat of climate change, the experience was an all too real taste of what’s to come if they don’t do something about now.